Earlier today, superhero franchise Marvel dropped the poster for the upcoming film Black Panther. Set to be released February 16 2018, fans are given a glimpse of actor Chadwick Boseman’s embodiment of the comic book character. The promotional image shows Boseman staring down spectators from his jagged thrown. Adorned in a sleek black suit with dagger-like claws, the character has already caused a stir and fans have taken to Twitter in excitement. With the hashtag “#BlackPanther” now trending on social media, this exclusive look is just the beginning. It was reported by the Hollywood news website Deadline that a trailer is also set to be released during game four of the NBA Final. Summarized by Deadline, the story is set in the fictional kingdom Wakanda. 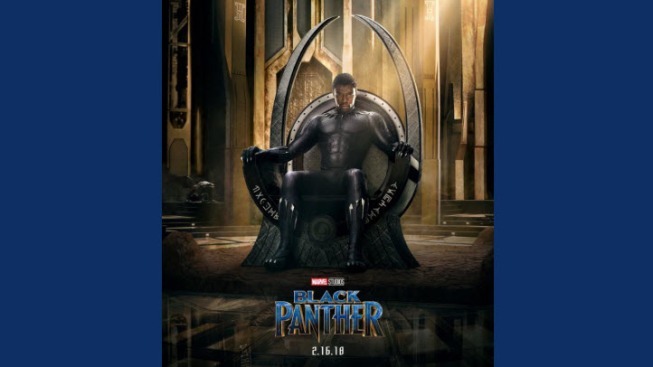 After Boseman’s character, T’Challa, learning of his father’s death, he is left to step in and claim the thrown as his own. But as with every super hero movie, the new king is confronted by evil. It is during this point that T’Challa must gather his strength as Black Panther and defend both his country and the world. Follow Marvel’s Twitter page for more ‘Black Panther’ updates.